Sky ! – Dirty wet dog , boats and sailing. Lots and lots of wide open sky. We have been on our travels, unfortunately that had to be by car rather than boat but it did mean that we went to some places that i may not otherwise get to for a few years yet in the small boat voyages. What with one thing (my back problems) and another we decided that we really wanted a break away from here and with the boat being a bit of a non-option went off with the car and did some camping and pod-ing : i will cover the pod experience in a separate post as that was one side of the country and this one completely over on the opposite coast. This is for those that don’t recognise it the north Norfolk coast around Blakeney and Wells and somewhere that i haven’t visited for 40 years or more : last time and i think the only time i went there was on a school camping trip to Wells when i was about 15. Just for interests sake i re-found the same campsite except that it isn’t a campsite any more but the dullest and most uniform caravan park imaginable so we gave that a miss. The vague memory i have is of Wells being quite cheap and cheerful with fish and chips on the harbourfront, kids dunking lines for crabs off the quay…..and i am really glad to say that it has hardly changed at all with the same shellfish stand on the harbour wall, the same rock and fudge shop and probably the same kids dunking lines for crabs except that its probably their kids doing it now. 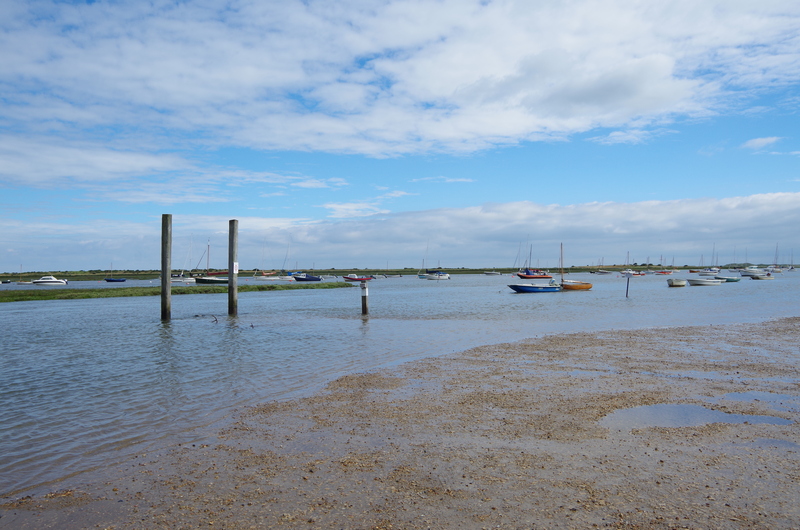 Its still as jolly and unprtetentious as i remember it and long may that last but what i didn’t remember is the horizon-wide sky, the fascinatingly complex creeks and salt-marsh and the ever changing light on the water and sandbanks. I could have sat all day just watching the whole scene change with the tides and the amazing light but being quite keen to get amongst it all we also went for walks along the coastal path which winds its way among the salt-marsh and occasionally the wilder sections of the open coast. The open sections of the coast we did see during our walking do feel quite wild even though they are easily accessible. Often all i had to do with the camera was just point and click as each frame seemed to capture something that had interest, i’m sure a better photographer would get a lot more out of it and even i thought that what i really wanted to do was try and stitch a whole load of separate images together to get a horizon-scale panorama. It was a bit odd seeing it all as a tourist and not as a sailor, the boats and creeks i will come back to in a separate post : of course i would like to take my boat there as it would be perfect for the area but i almost feel that it needs something even smaller and lighter, maybe a dinghy….it would be great for a wayfarer but equally a whole lot of fun in a sailing canoe or sea kayak. On the last evening we were there it was good to see that Wells is still an active fishing harbour too as the crabbers came in on the tide and offloaded crates and crates of fresh Norfolk crab…all ready to be taken straight to market. Stephen Mundane wrote : “Great photos Steve. I love Wells too, having spent many a childhood holiday there in the early 70s, catching crabs off the quay and playing in the sand dunes and pine woods — heaven on earth. Next A short camp interlude. Great photos Steve. I love Wells too, having spent many a childhood holiday there in the early 70s, catching crabs off the quay and playing in the sand dunes and pine woods — heaven on earth.